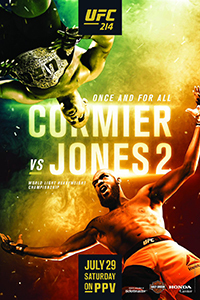 For the first time in a long time, it's fair to say that the title pictures of the UFC welterweight and middleweight divisions are finally clear. 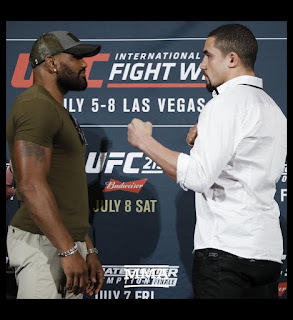 At 170 pounds, UFC Welterweight Champion Tyron Woodley will finally defend his belt against Demian Maia, as their title fight was announced for UFC 214's blockbuster card, headlined by the epic rematch between Daniel Cormier and Jon Jones. Woodley vs. Maia will presumably be the co-main event on the card, and, along with Cristiane Cyborg vs. Tonya Evinger, be part of a three title fight offering on pay-per-view. 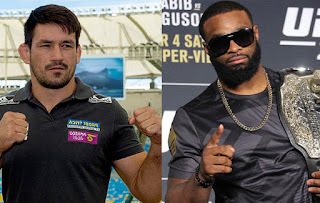 While Woodley vs. Maia made sense all along -- even before Maia's recent victory over Jorge Masvidal that cemented his spot as the #1 contender -- there was still talk that Woodley would fight someone else in a bigger "money fight" instead. At first it was a possible matchup against Georges St-Pierre, then a fight with Conor McGregor, then a fight with Nick Diaz, and now we're finally at Maia, who absolutely deserves this title shot. One of the fighters who says Maia deserves the title shot is GSP, who isn't expected to be fighting Michael Bisping anymore. That fight never made sense, so it's good that it's not happening now. (More on the middleweight division soon). According to UFC President Dana White, when GSP returns this winter he wants to fight the winner of Woodley vs. Maia and try to recapture the welterweight championship. GSP moving up to middleweight never made sense either, and stylistically, GSP taking on either Woodley or Maia could make for very intriguing fights, so GSP going back to 170 when he returns is good for everyone. So to sum it all up at 170: Woodley fights Maia at UFC 214 later this month, and the winner fights GSP at Madison Square Garden in New York City in November, at least if all goes according to plan. (Sorry Edmonton fans, but UFC 215 in September is just too soon to see GSP fight, as it's always made way more sense for the former longtime champion to come back under the bright lights in NYC.) The UFC is hoping now that everything goes according to plan, and no more movie shoots pop up for St-Pierre. At 185 pounds, things were murky because GSP vs. Bisping was holding up the rest of the division. The fight wasn't even exciting on paper, so I have no idea why the UFC was holding onto it for so long, but it's clear now that this fight is no longer in the UFC's plans. That's unfortunate for Bisping, who was likely hoping for one more huge payday before retiring, but his injuries delayed the fight, and there's still no word on when the UFC Middleweight Champion willl return and defend his title. The middleweight division has been in a holding pattern for a year now, ever since Bisping shocked the world and knocked out Luke Rockhold at UFC 199, but finally we will be able to move on at UFC 213. That's when Yoel Romero fights Robert Whittaker for the interim title, with the winner presumably facing Bisping down the road. Having an interim belt makes a lot of sense, as it gives the rest of the division something to fight for while Bisping heals up. After months and months of confusion, the championship tiers of the welterweight and middleweight divisions are finally starting to look clear. At 170, Woodley will fight Maia at UFC 214, with the winner getting GSP later this year. At 185, Romero will fight Whittaker for the interim title at UFC 213, with the winner getting Bisping later this year. There's still lots of cause for concern with injuries, but for now, the murkiness in these two divisions is finally starting to clear up. And that is a great thing for fans. 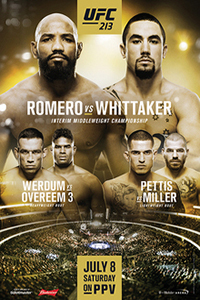 UFC 213: Romero vs. Whittaker (formerly UFC 213: Nunes vs. Shevchenko) takes place July 8, 2017 at T-Mobile Arena in Las Vegas, Nevada. Click the stars to rate how good you think UFC 213 will be. UFC 214: Cormier vs. Jones 2 takes place July 29, 2017 at Honda Center in Anaheim, California. Click the stars to rate how good you think UFC 214 will be.